Saturday night’s lopsided victory for Errol Spence Jr. inside AT&T Stadium was far from a shock. For months leading up to this weight-straddling “super-fight,” the narrative was set in stone as a mismatch between a big’un and a littlen — Mikey Garcia daring to be great in leapfrogging up to the welterweight limit to take on the ferocious-punching Spence at 147 pounds. We could see the script a mile off, but as boxing fans, we like to over-think, over-analyse and, eventually, convince ourselves that the boxing gods may smile down on a Hollywood script. We dared to dream that this contest could produce the thrills and drama that Hagler vs Duran managed in 1983; Duran jumping up in weight to challenge for Marvelous’ middleweight trinkets over 15 engaging rounds. As the fight neared, quotes from ex-fighters, soundbites from esteemed pundits and convincing arguments laid out by respected trainers in the sport began spinning the rhetoric for a Garcia victory. Boxing off the back foot and using his speed and footwork were to be the keys for victory in the eyes of the challenger; the odds tightened as we approached the first bell, but at 1/4 Spence was still deemed as backable, squeezing minimal value out of the market. Mikey’s chance in the fight was oversold. On fight night Spence proved himself to be too slick, too powerful and too active for Mikey to come close to causing the champion any issues in the fight. 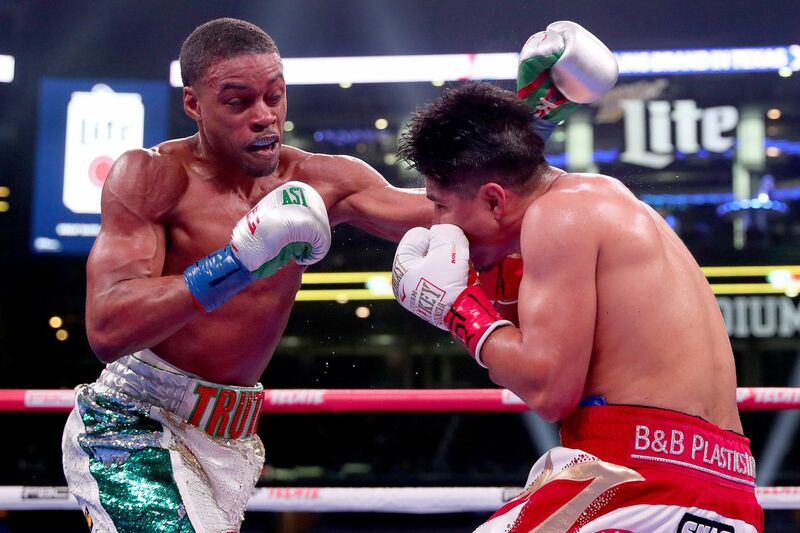 His post-fight claims of waiting to land a destructive blow late in the fight were a little misleading — his fighting pride enabled him to last all 12 rounds, but to put a dent in Spence in the final six minutes would have taken more than a miracle. Garcia was gracious in defeat. His raised fist following most of the rounds was a recognition to him surviving another three minutes, rather than making any impression on the contest. “He’s the truth. He’s for real,” Garcia said after the final bell. Garcia didn’t manage to land more than 10 punches in any single round. There are strong arguments to suggest that the challenger should have been retired in the championship rounds. However, Spence was allowed to walk through his opponent searching until the final minute for a twelfth straight stoppage victory. It was a little awkward and painful to watch as the fight chuntered to its conclusion. It’s a thankless task trying to read too far into Spence’s standing in the welterweight division, and even more so the mythical pound-for-pound standings, following this victory. Did we really learn more about Spence’s abilities in a dissection of a guy who should be campaigning two weights below? Spence’s activity is one area where improvements can be assessed. The 29-year-old southpaw landed a career-high 345 of the 1,082 punches (32%) he threw. That included 237 of 464 (51%) power punches, with the ninth round proving the most fruitful in hurting Garcia. Sure, being that this is the first time Spence has gone the 12-round distance as a professional it’s hardly surprising that he is hitting these numbers. However, his overall ring IQ dispelled the myth that he is simply a one-dimensional slugger. Spence’s tactics were spot on against a skilled Garcia who many believed could find gaps in The Truth’s defence. Spence’s footwork surprised many of us, with his ring generalship tying Garcia in knots that Houdini would have struggled to break from. It’s a testament to the champion that a lot of the success he enjoyed in the fight would still have come if they were naturally matched in weight. Manny Pacquiao’s entrance to the ring was encouraged by Spence, who looks eager to force a fight with the Filipino legend and less celebrated WBA “world” champion at 147 pounds. “Yeah, why not? We’ll give the fans a good fight. I’m so happy to be here in Dallas and I’m hoping I will be back here soon.” This was Manny’s default answer to the pressure Spence was putting him under in regards to a fight this year. He’s a politician, after all. Two PBC fighters shouldn’t have too many problems in signing this fight, but despite the hype, there are better alternatives for both guys. Pacquiao would risk what is left in his twilighting career stepping into the ring with the hard-hitting Spence. Manny can’t afford another loss if he is to lure Mayweather back into th……. (Ok, boring. I’m not going over that ground again). Spence, on the other hand, has plenty of options as he verges towards unifications, and eventually a jump up to 154 pounds. The winner of April 20th’s Garcia vs. Granados fight? Yordenis Ugas? A dip into European waters against the underrated Kerman Lejarraga? WBC titlist Shawn Porter expressed his interest in a unification — the most likely across the weight. Spence stated, “If the Manny Pacquiao fight don’t happen then I’d definitely take that fight with Shawn Porter. “You know I’ve been wanting that fight. I told Shawn after the Danny Garcia fight let’s make the fight happen, but it didn’t and that’s why I fought Mikey (Garcia). Spence’s win on Saturday night was certainly expected, but the manner of the victory is what will write the headlines in the coming week. Perhaps The Truth has been set free.